Unconvinced the Eastons can be fitting caretakers, Grace jumps at the chance to be Christian's nanny and observe the family up close under an assumed name. In the course of her new position, she is shocked to discover herself falling for Andrew Easton, the boy's guardian. Unfortunately, Andrew is promised to a spoiled socialite who will make a terrible stepmother for Christian. Will Grace be able to protect her nephew ... and her heart? 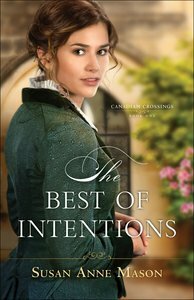 About "The Best of Intentions (#01 in Canadian Crossings Series)"